In her new book, Why do we care about literary characters? 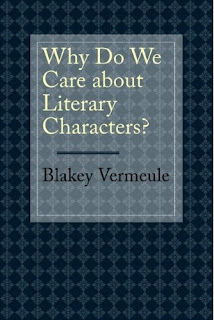 (2010), Blakey Vermeule argues that novels, and particularly eighteenth century British novels, exemplify the kind of explicit concern with intricate levels of mindreading with which readers care about engaging themselves. Characters read each others’ minds in the interest of self-preservation, flourishing, and status enhancement, and experiencing such fictions allows the reader to learn what she needs to survive and flourish in her own Machiavellian world. Vermeule’s book echoes Zunshine’s thesis in Why we read fiction: Theory of mind and the novel (2006): we read fiction because it stimulates our need for mindreading at several different levels of recursion (e.g., “Emma knew that Ricardo expected Angela to hope that Roger would call her.”) and because partaking of gossip just makes us feel good. Indeed, both Zunshine (p. 4) and Vermeule (p. 99) use the word “craving” to describe the reader’s stance toward social scenarios that require complex mindreading. An important difference though, is that Vermeule purports to speak of “caring” about characters, while Zunshine defends her avoidance of the topic of such engagement in fiction by noting on the next-to-last page of her book that, “[Theory of mind] is always much more than whatever cluster of cognitive adaptations we have isolated to make the discussion of it manageable“ (p. 163). That’s as much ground as Zunshine grants to her reader’s complaint that we can’t mindread without emotions. The reader accepts her hedge because she has presented a solid argument for what does interest her, and she leaves the emotion side of the theory of mind coin to others to explore. Vermeule, though, claims to address “care,” which she defines as “to be anxious and to exert mental energy” and “expending charity, even passion” (12). She claims an evolutionary psychological parentage for the concept. She notes, in brief, “Why do we care about fictional characters? The very short answer is gossip: we need to know what other people are like, not in the aggregate, but in the particular” (xii). She believes that a genuinely literary moment centrally features a character engaging in Machiavellian reasoning, which “engages some of the things we care about most” (81), and claims that the most celebrated literary characters are Machiavellian (52), that “the most important social information is whether somebody is inclined to cooperate in social exchange or to cheat” (146), and that the “highest power” one has in a social exchange is to get that assessment right (187). What we care about is making sure we come out ahead of others in personally relevant domains, and we care most about literary characters who do just that. Survival strategies are important, so we care about them. But there is another way to look at caring, one that the philosopher Harry G. Frankfurt treats with clarity and power in his essay “The importance of what we care about” (1998). (Vermeule mentions this titular phrase in her book [p. 73] and attributes it to Frankfurt, but she does not engage his ideas, nor cite his work in the bibliography.) Frankfurt says, “A person who cares about something… identifies himself with what he cares about in the sense that he makes himself vulnerable to losses and susceptible to benefits depending upon whether what he cares about is diminished or enhanced” (1998, p. 83, Frankfurt’s emphasis). And further, “…if there is something that a person does care about, then it follows that it is important to him. This is not because caring somehow involves an infallible judgment concerning the importance of its object. Rather, it is because caring about something makes that thing important to the person who cares about it” (1998, p. 92). It seems, though, that Vermeule’s reader feels care because she makes an “infallible” evolutionarily-driven judgment that leads her to assess exposure to Machiavellian characters and their actions as important to her own social understanding. So, why do we care for fictional characters? Frankfurt does not comment on this question, but we might be able to construct a Frankfurtian response. First, he does not deny the important role of evolution in human caring. In his meditation on love, an extreme form of caring, he notes, “What we love is shaped by the universal exigencies of human life,” but then he adds, “together with those other needs and interests that derive more particularly from the features of individual character and experience” (Frankfurt, 2004, p. 47). The character the reader cares for or loves fits who the reader is, today, in the moment of reading, not only as a human who wants to survive and flourish, but as a cultural being with a particular cultural, personal and interpersonal history, which her care for particular characters may help her to understand better. Frankfurt does deny that we can care for an individual only as a token of, even a fine exemplar of, a class: “The significance to the lover of what he loves is not that his beloved is an instance or exemplar. Its importance to him is not generic; it is ineluctably particular” (2004, p. 44). Thus, perhaps we don’t care for literary characters because we get loads and loads of social information from them – isn’t our effort better spent in getting social information relevant to the living, breathing cast of characters in our own lives?—nor because they are exemplars of Machiavellian pursuits which could somehow edify us. Frankfurt’s account of care can thus accommodate those readers who care about individual embodiments of a whole range of characters: the weak ones, the misguided ones, the self-delusional ones, the ones who would very much like to be Machiavellian, but eventually discover that, alas, they are not -- the ones, in short, who make us vulnerable to emotional losses because they suffer while we are identifying with them. He claims that it is “volitional necessity” that moves us to care and to love. He says that “[caring about something] serves to connect us actively to our lives in ways which are creative of ourselves and which expose us to distinctive possibilities for necessity and for freedom” (1998, p. 93) and ends his essay on care in this way: “The person does not care about the object because its worthiness commands that he do so. On the other hand, the worthiness of the activity of caring commands that he choose an object which he will be able to care about” (1998, p. 94). Maybe the history of human engagement with fiction is less the history of a creature craving mindreading in order to more efficiently usurp the goods of its conspecifics, and more the history of a creature who is exceptionally good at caring, and much in need of more and more things to care about, or to love, than the world could ever make available in the creature’s lifetime. Frankfurt, H. G. (1998). The Importance of what we care about. New York: Cambridge University Press. Frankfurt, H. G. (2004). The Reasons of love. Princeton: Princeton University Press. Vermeule, B. (2010). 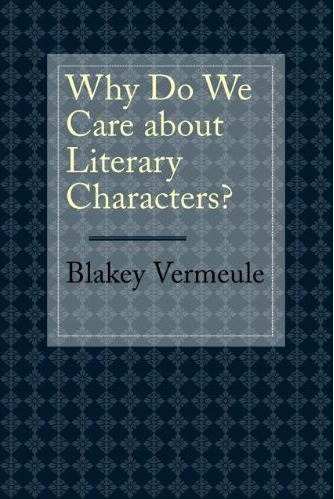 Why do we care about literary characters? Baltimore: The Johns Hopkins University Press. Zunshine, L. (2006). Why we read fiction: Theory of mind and the novel. Columbus, OH: The Ohio State University Press. I read this essay when you first posted it and enjoyed it very much. But I’ve never decided quite what I wanted to say. So, I am going to say something now even though it may be less than crystal clear. Why do we care about fictional characters? Why do we care about unique individuals? You suggest that we are the sort of creatures that are uniquely good at caring. So, would it follow, then, that through caring we are both happier and more ourselves? I can’t help mentioning that in Book One of Plato’s “Republic” the character of Socrates says we are uniquely good at being just. When you add that the job of a just person is never to harm others, but always to make them better, that’s a powerful thesis. It hasn’t got “care” or “love” in it verbally, but if someone makes me better, that should mean making me better in all sorts of ways. Finally, you have done me a great service by drawing my attention to Frankfurt’s writings. I shall have to get hold of them. But, I found the passages you quoted implausible, as a whole. Frankfurt seems to be saying: Something about the nature of our psychological states has the consequence that we develop when we care, whether or not the thing that we care about is really good for us. Is that what Frankfurt thinks? I realize that we often love those who are not good for us, but, if we try to be realistic or down to earth, is that really what we want? Or what we would recommend to others we care about? This returns to the Socratic point I mentioned above. Well, thanks again for an essay that I enjoyed reading, and thanks too for pointing me in the direction of Frankfurt. Thanks very much, Mark L., for your comments and questions, which are central to the issues Frankfurt raises. Frankfurt does in fact address some of these questions, albeit not in the parts of his work that I cited in the post. I’ll address the questions you raise more or less in the order you present them. For Frankfurt, it does indeed follow that through caring about other things and persons, and I suspect, about literary characters, we are more ourselves. From what I’ve read of Frankfurt, I don’t think he would phrase this in terms of becoming happier. He does talk about experiencing “wholeheartedness” or feeling “satisfied with ourselves” (2004, p. 99). He mentions in a footnote that Spinoza considered this experience to be “the highest thing we can hope for” (Frankfurt cites the Ethics 4-52S). So, in that sense, it may be a sort of happiness. Concerning the divergence between Frankfurt and Plato, it seems to me that Frankfurt is not concerned with justifying for others our care or love for one thing rather than another. In the first paragraph of his essay “The importance of what we care about,” he cleaves questions concerning “what to care about” (1998, p. 80) rather cleanly from those concerning epistemology, that is “what to believe,” and (some might argue too cleanly) from those concerning ethics, that is “how to behave”. He notes, “those disciplines need not reflect upon the nature of caring as such, nor are they obliged to consider what is implied by the fact that we are creatures to whom things matter” (p. 80). Thinking about care and love is not a normative enterprise for Frankfurt. Contemporary ethical concerns about the possible impurity of care or love in the presence of self-benefit, which Reshotko claims was not present in Plato, is a problem that Frankfurt takes very seriously. The last third of his book The Reasons of Love presents a chapter entitled “The Dear Self,” which cites the phrase Kant used to describe the force that he took to be the most important object of our concern, even when faced with questions of duty toward others. Frankfurt claims that Kant is not so much mistaken as simply “out of focus” on this question (2004, p. 78). He takes Kant’s concept of “the dear self” to refer more strictly to a concern with indulging the self, rather than to loving the self, and claims that we do not show concern for ourselves through indulging “impulses and desires” (2004, p. 79). He thinks self-love, at least in its rudimentary form, is “the desire of a person to love”, and as “a person’s desire to have goals that he must accept as his own and to which he is devoted for their own sakes rather than merely for their instrumental value” (2004, p. 90). The subject of the penultimate section of Frankfurt’s (2004) book is the question of whether a person can “love what is evaluationally nondescript, or what is bad, or what is evil” (p. 98). He thinks people can and do sometimes do this. To the inquiry of whether we would really want to love those who are not good for us, or whether we would recommend such a love to others that we care about, Frankfurt would again appeal, I think, to the cleaving of a philosophy of care from the philosophy of ethics – but also to his concept of “volitional necessity”. The individual cares about “an object which he will be able to care about” (1998, p. 94). For Frankfurt, the question to be posed is not a normative one, but rather a descriptive one. Concerning our knowledge of the things we care about, reminds me of Keith’s post of September 9, 2010 in which he asks, “Does a piece of fiction need to be as long as a novel or a television series for a fictional character to become real, to be really loved?” I think that this is an important question, and it resonates well with your suggestion that we don’t really finish with knowing the things and persons we care about. Perhaps we read novels when we feel uninhibited in engaging our caring selves, when we feel ready both to know more and more about another (fictional) person, and indeed ready to want to know more about her or him. It's possible that we read short stories when we are experiencing less capacity for engaging in the emotions and needs of others. Thanks again for your comments. thank you very much for your essay and further explanations. I could agree with them from the perspective of a reader: I also don't explicitly search for stories involving successful characters, but the ones who are imperfect and vulnerable and perhaps suffer some loss during the story. This is what makes them human and by engaging with them I understand better my humanity as well. This helps me to feel the 'wholeheartedness' - to be satisfied with myself in spite of the mistakes I've made or the characteristics I am not proud of. Literature is thus one of the most important meands that helps me to achieve a psychological stability and overcome bad moments in my life. It is in this sense that I perceive it as evolutionary useful.